Sat., Aug. 4, 2018, 8:36 a.m.
A GRIP ON SPORTS • Whistles. Horns. Loud voices. Cleats on cement. Deep breathing. Cries of joy – and disappointment. Feet hitting turf. Such are the sounds of football practice. And they were heard again yesterday on the Palouse. College football is back. Read on. • Attending a football practice is not just a visual experience. It’s an aural one as well. Maybe not as much in the first few days, before the pads are put on, but throughout the season you can tell as much from the noises you hear as you can from the sights you see. Effort and energy are easy to hear. The sounds emanating from a bored team are different than ones you hear while watching an engaged group. The former includes more off-color comments and loud beseeching from the coaching staff. The latter? Less yelling and more thumping. But such things don’t really come into play on opening day. Everyone is fired-up to practice on the first day. Everything is possible, everything is new, everything is Christmas-like. And it didn’t hurt those who started yesterday in Pullman and Moscow that the weather wasn’t typical of mid-August. Warm, sure, but not too warm. Perfect weather to get about your work. College football has one constant. Change. The Cougars are looking for a quarterback. The Vandals are looking at a new conference. Each lost key seniors, each have newcomers ready to contribute. The same thing will play at in Cheney and at Whitworth soon. The games? They are still weeks away. By the time the sneak into view, the players will be tired of hitting each other and ready to hit someone new. But that’s for then. For now, practice is starting, the future seems bright and the campuses are alive with the sounds of football. 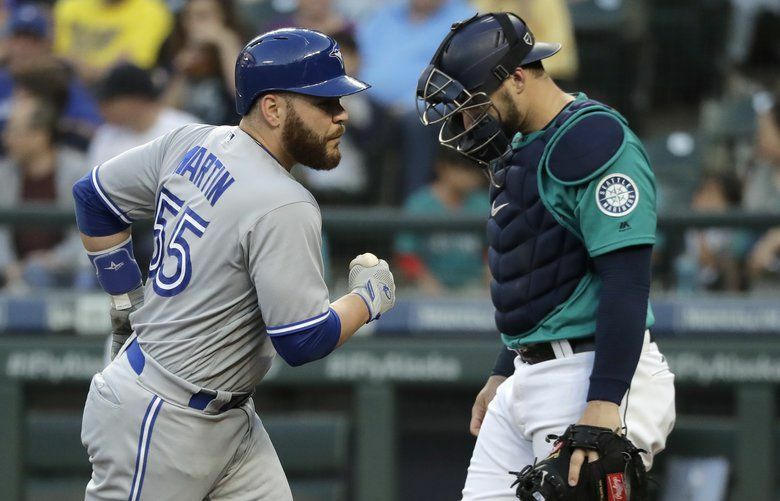 • If you are wondering why today’s column didn’t lead with the Mariners’ on-going collapse, the answer is simple: We are writing about the M’s for tomorrow’s paper and don’t want to be redundant. How many times can you say “crud?” I guess you could translate it into a bunch of different languages and get by, but the bottom line is it would still be messy and gross, sort of like how the M’s have played since early July. A season that seemed so filled with promise and potential ruined by a few weeks of strike outs and weak fly balls. No, it’s not over. The good ship Mariner could be turned into the wind again and still make it to the finish line first. But it feels as if the sails are tattered, the rudder is broken and the anchor is caught on the remnants of Atlantis or something. WSU: The Cougars took the field in Pullman yesterday. Theo Lawson was there. The Cougars will head down to Lewiston today. Theo Lawson will be there. And he’ll have stories. 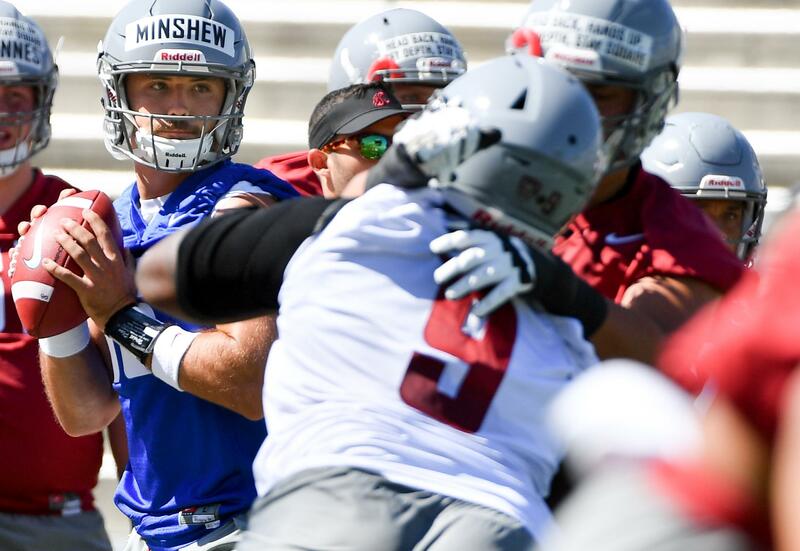 He has two for you today, one a summary of what went on yesterday and the other on transfer Gardner Minshew and the other quarterbacks. … You like video interviews? Theo has a lot of those as well, from Mike Leach and assistant coach Dave Nichol to players Hunter Dale, Andre Dillard and Minshew. When is someone going to start a Twitter account for Minshew’s mustache? I would, but I’m not that funny. … Elsewhere in the Pac-12, Washington opened camp without one of its most-touted recruits. … Oregon also opened camp with another new head coach. … On Oregon State’s first day, the quarterback battle took center stage. … Tavita Pritchard takes the reins of Stanford’s offense. Not as quarterback but as coordinator. … It’s taken three seasons for a Colorado freshman receiver to get on the field. … If Utah is going to meet its high expectations this season, one of the reasons why is its young leadership. … Could USC have a true freshman starting at quarterback? … UCLA’s first practice showed some things no one expected to see. … Arizona State will probably go as far as quarterback Manny Wilkins can take it. … Preseason practices are about building a new culture at Arizona as much as anything. EWU: The Eagles don’t begin until Sunday. To get you through today, Ryan Collingwood has five questions Eastern needs to answer in preseason camp. Idaho: Yes, the Vandals began practice yesterday. And Peter Harriman has a story. But the big news this weekend is alum Jerry Kramer finally taking his place in the Pro Football Hall of Fame. Heck, he should have been in the writer’s wing years ago. “Instant Replay” was the NFL yin to “Ball Four’s” baseball yang for Baby Boomers. Indians: Spokane’s road woes have returned in Eugene. The Indians lost 6-1 last night. … Elsewhere in the Northwest League, host Everett got past Boise. Preps: Summer softball and baseball seasons are winding down. Mariners: If there is any area that has let the M’s down more recently than the bullpen, it would have to be the offense. Both combined to seal a 7-2 loss to Toronto last night. Afterward, there was the off-limits players-only meeting. That will fix everything. … The last time James Paxton pitched against Toronto, he threw a no-hitter. … Oakland won another extra-inning game – the A’s lead Seattle by 1.5 games in the wild-card race – and seem to be the better team. … Larry Weir’s most recent Press Box Pod covers the M’s and the Hawks and college football. Seahawks: Training camp has been going on for a week, and certain players have stood out, including the Griffin brothers. … Certain positions have more clarity than others. … Earl Thomas is wracking up the fines. Sounders: Seattle faces Minnesota on the road today. … Former Seattle coach Sigi Schmid has revitalized his career in Los Angeles. Published: Aug. 4, 2018, 8:36 a.m.